Kaduna State Governor Nasir el-Rufai has revealed that a group comprising governors and ministers has been constituted to ensure President Muhammadu Buhari seeks a re-election in 2019. The governor revealed this in an interview with State House reporters on Friday before joining President Buhari for juma'at prayer at the Presidential Villa mosque. He said none of the group's members, including himself, has any personal ambition except the political ideology of supporting President Buhari's cause. El-rufai, however, stressed that if Buhari chose not to contest in 2019, he (the president) would show the group the direction to go. "My name has continuously been mentioned as a presidential aspirant s‎ince 2007 after my years in the FCT. There's nothing new about that. What I want to say here very clearly is that I've never been a presidential aspirant, I've never even been a gubernatorial aspirant. I'm governor today by the grace of God because President Buhari called me and said go and run for governor of Kaduna State. As far as 2019 is concerned, my position is the president is looking very well, he is recuperating very fast. My hope and prayer is he'll contest in 2019. On the support declared by the Minister of Women, Aisha Alhassan, for former Vice President Atiku Abubakar against Buhari on the 2019 presidency, el-rufai said the president was warned against appointing her. 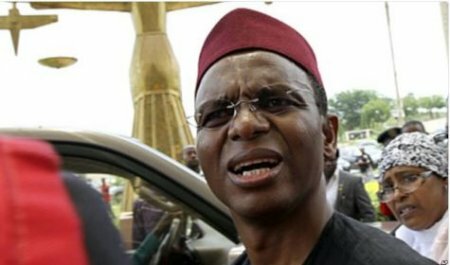 Rufai is another man that is very trickshi when it come to politics.